While at LinuxTag 2008, I met with Jure Kodzoman of Interchange fame. Interchange is a well established Open Source e-commerce platform, existing for over 12 years, and very popular in the USA. We sat down to discuss from a marketing perspective the Interchange website and a brochure they created for distribution at their LinuxTag booth. The current domain name of the website (icdevgroup.org) is extremely hard to remember because it does not relate to the Interchange brand. The domain needs to be in sync with the project name, hence they should move the website to a domain that includes “interchange” in its name. It need not be a .com TLD, .org or .net suffice for a community-driven OSS project. 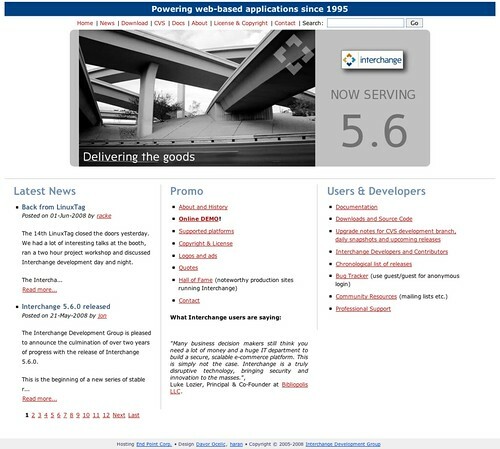 Today’s tagline ” Powering web-based applications since 1995″ does not tell that Interchange is an e-commerce platform nor that it is Open Source. Better taglines would be “The most flexible Open Source E-commerce Platform” or “The first Open Source E-commerce Platform” or “The Open Source Platform Powering E-commerce world-wide since 1995”. It’s a great selling point that Interchange exists since 1995 and it might be a valid claim that they are – yet another potential tagline – “The first Open Source Alternative for E-commerce”. It is better to communicate only one major news on the front page through a banner especially to guide new visitors. For example, don’t advertise LinuxTag in one banner plus a general banner plus a banner about the Interchange 5.6 release in the same space. Instead, highlight the 5.6 release in a banner, provide a link to a landing page and at that landing page, say: “Come to LinuxTag and get a hands-on demo”.